It's no secret that I love lipsticks. Whilst brands such as MAC and Illamasqua will always have a place in my collection, the majority of my go-to lipsticks are made up of these three brands: Australis, Innoxa and Chi Chi. And it wasn't until recently that I realised all 3 are very purse friendly and all are Australian brands. So yes, here I am helping Australia's economy one lipstick at a time. Their Go Longwear lipsticks are without a doubt one of the longest lasting lipsticks around. The matte formula can be drying at times but nothing a little lip balm can't fix. The choice of colours is trendy, and the price of $12.95 is something you can't pass up on. You can see my swatches of the entire range HERE. I've also just discovered their Velourlips ($9.95) range and it was instant love. My only issue with them is the choice of colours - the almost fluoro shades are too bright even for a bright lipstick lover like me. Rio D (coral) is the most wearable of them all, and HERE is my review of it. I'm surprised I haven't blogged about Innoxa lipsticks ($14.95) before because their matte lipsticks are to.die.for. They actually feel quite creamy on the lips yet have a matte appearance. They're lightweight, highly pigmented and with a lovely fragrance I can't quite put my finger on. Something a bit citrusy perhaps? Either way it feels refreshing on and I have quite a few of them with Pink Peony being my absolute favourite. Chi Chi has had a real brand overhaul in the last few years. I remember seeing them at Target years ago but never really went near them as the products looked old, dusty and dirty like no one had touched them in years. Then all of a sudden bam, I noticed the packaging changed, the quality of products improved and what do you know their lipsticks ($18.85) fast became favourites of mine. Fashion Police is an absolute favourite (review HERE), and not just because it's similar in colour to MAC Impassioned. I also recently picked up their new Creamy Matte liquid lips ($16.95) and so far I'm really impressed with them. Here are some quick arm swatches. Stockist information: for Australis click HERE, for Innoxa click HERE and for Chi Chi click HERE. 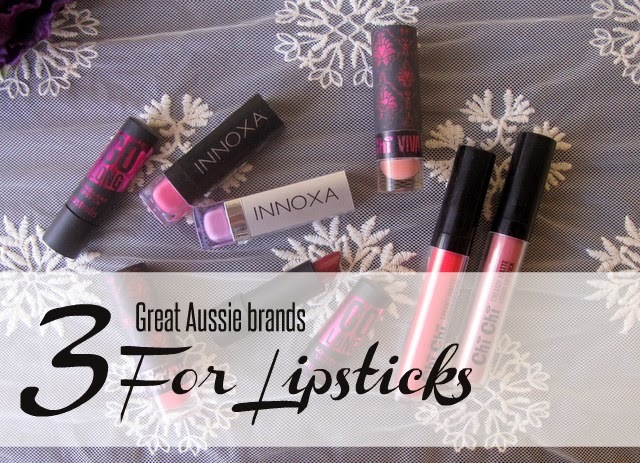 Have you tried any lip products from these above brands? Any favourites? Thank you! We have some great products here so why not show them off! Love the packaging of Chi Chi! It is very cute isn't it? Ive never really tried any aussie brands before! Here ive only seen napoleon perdis.